born at Toronto, Ontario, Canada on August 18, 1881. 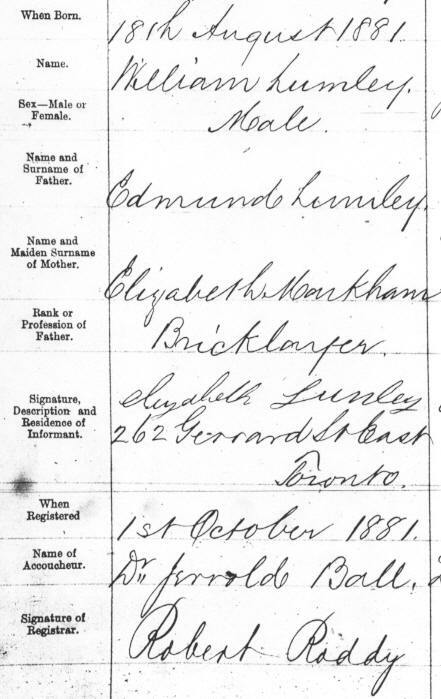 While searching around at the library to-day, I came across the following birth registration for William Lumley. This must be: "William Lumley, born August 18, 1881, and who disappeared to the U.S.A."
See our Lumley Page for details of this family. Please contact Robert Sewell for further information. Please note that William does not have any living descendants on our side of the family; his only known son Eddie d.s.p.